You are invited to join as we celebrate the Easter story. Our Good Friday (19th April) morning service is at 10:00am, but please arrive from 9:30am for Hot Cross Buns. We’ll explore the Easter story in a fun, interactive way, with songs and drama, lasting around 45 minutes. At 11:00am, you are invited to join us at St Joseph’s for a short Station of the Cross service. At 11:30am a walk will start from St Catherine’s to join the public Act of Witness at the Triangle which starts at 12noon. At 2:00pm there is a quiet meditation hour. Our Easter Sunday (21st April) celebrations start with our normal 8:00am spoken Communion service. Our Easter Sunday All Star Family Communion at 9:30 will include an Easter Egg hunt and should last about an hour. Journey through the Lord’s Prayer in 6 interactive sessions and deepen your prayer life. Covering topics such as intercession, dealing with disappointment, learning to listen and spiritual warfare. 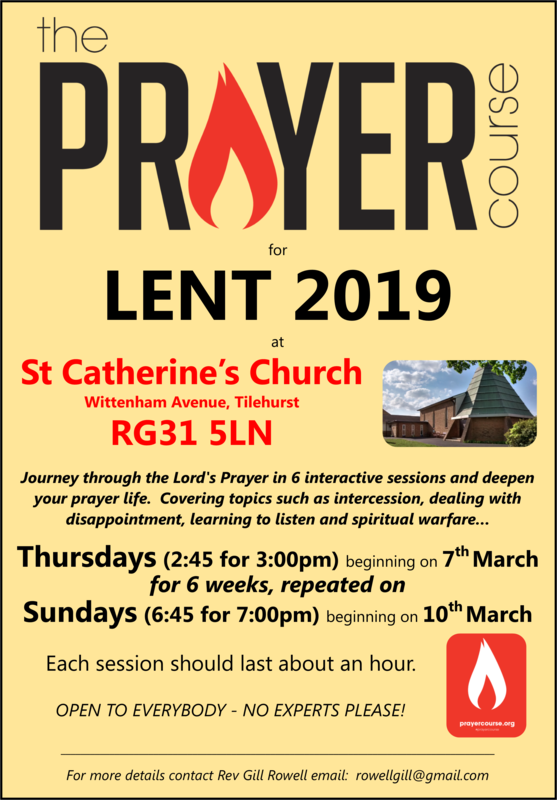 Thursdays (2:45 for 3:00pm) beginning on 7th March for 6 weeks, repeated on Sundays (6:45 for 7:00pm) beginning on 10th March. Each session should last about an hour. Open to everybody! Every six years the parish is required to prepare a new electoral roll. Members previously on the roll must re-apply to be included – inclusion is not automatic. New people may also apply. A person applies by filling out an application for enrolment form which can be found at both churches. Forms must be returned by 17th March 2019. What is the Electoral Roll and why might you want to join it ? The cartoon below may help. The PCC of Tilehurst : St Catherine and Calcot : St Birinus regret that the above mentioned Electoral Rock is not available. 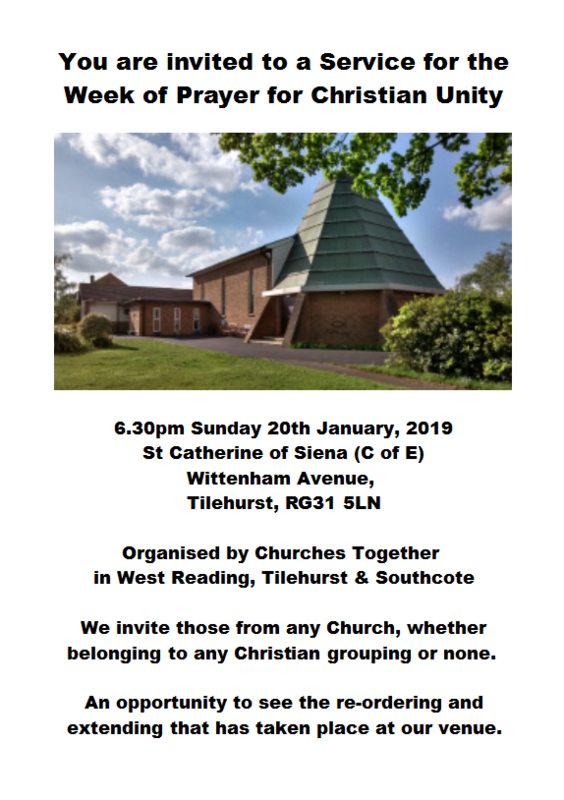 You are invited to a Service for the Week of Prayer for Christian Unity at 6.30pm on Sunday 20th January, organised by Churches Together in West Reading, Tilehurst & Southcote. We invite those from any Church, whether belonging to any Christian grouping or none.